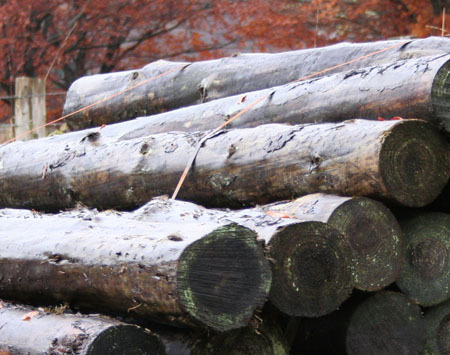 Treated square and round fence posts, turners, strainers from Perthshire Timber Co. Polney Sawmill Dunkeld, perthshire, Scotland. 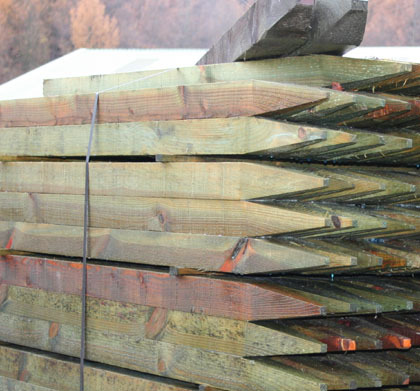 We are able to advise you on the number and size of square posts, strainers and turners you will need. Strainers (we supply typically min 175mm or 7 inch diameter) are used at the start and finish of a wire fence to secure and tension the wire. Turners, (smaller than strainers, we supply typically up to 150mm or 6 inch diameter) are used where the fence changes direction or "turns". The longer lengths are used for 6 feet high deer fences. We tend to keep a number of common post sizes of 75 x 75 and 95 x 95 ranging from 1.65m up to 3m. Please phone to check availability at any time.